Extremely hot, yellow colored pepper looking much like the habanero. 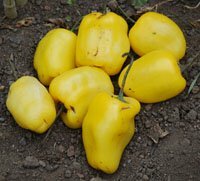 Seeds are from the rare yellow-skinned type, the hottest of the three Manzano peppers, with a scorching heat! This pepper is a rocoto tree pepper relative and is noted for its cold hardiness, as it naturally grows on Andean mountain slopes, this pepper can survive frosts. Plants grow to 2-6ft, can live for many years.